All the payments done within your Training-Online.eu platform are secured by PayPal service and all the payment options offered by this service are available. The amount generated by LMS is prefilled, its up to you complete the steps required for the payment. 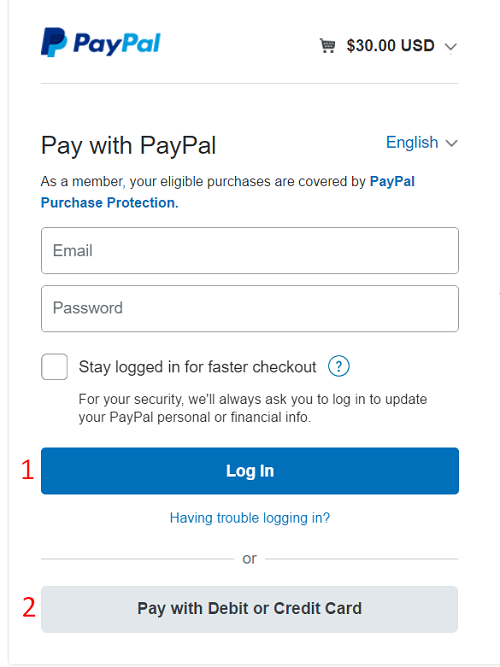 Use your PayPal login details and enter the payment service. You need to create you PayPal account. You may use Visa, MasterCard, Discover, or American Express to complete PayPal payments. Whoever may do the payment with no need of registration. One of the PayPal options is to link your bank account. This needs to create your PayPal account. Once the payment is finished you are redirected back to your LMS account into the Wallet module. You should see the increased credit balance immediately but happens time to time that the PayPal service handles too many requests and its response is slower. You may see the status of transaction in the transactions tab. Anyway once your payment is completed you should be informed about credit add by the notification email coming from your e-Learning platform. In this case we have paid 1 USD and the payment is confirmed already. In case not, there will be sign Credit purchase - waiting for confirmation.